This is the latest and, they tell us, the last of EMI’s Simon Rattle Edition, gathering together the conductor’s complete forays into certain composers and repertoire. As with any such project the sets hitherto released have contained both treasures and duds. Even though not everything here is perfect, this set sends the series out on a high with his complete Vienna recording of the Beethoven symphonies. 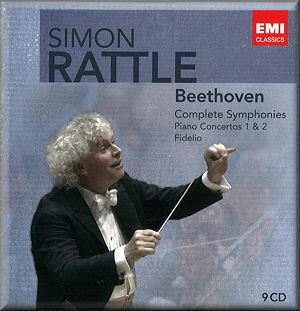 Not everyone has been convinced by Rattle’s 2002 Beethoven set, but I admit that I was sold on it from the start. Repackaged here at bargain price, even if the documentation is minimal, it makes an outstanding bargain and a fantastic purchase. The keynote of the set is energy: pulsating, crackling, electrifying energy. Rattle’s white-hot vision injects these scores with a level of vigour that I have seldom heard elsewhere on disc. In particular he relishes the punch and excitement of Beethoven’s rhythms. Unsurprisingly this approach works best in the Seventh where the relentlessness of the beat bounds off the page. The Scherzo, in particular, is unstoppable, while the first movement is expansive and majestic in its control. Ineluctable, unarguable logic characterises the unfolding of the Allegretto, secure in pacing and awesome in its scale, though next to all this the opening of the finale comes across as surprisingly slow. This approach also works brilliantly in the early works, particularly the Second which here comes across as a work of fully mature genius. The first movement positively crackles, recreating for me the infectious excitement of discovering these works – of hearing them for the first time. Similarly, the finale positively leaps out of the speakers, while the Larghetto is beautifully judged and gorgeously played. The First too is full of bustling energy and the Andante is taken at a fair lick, though this isn’t something Rattle does in all slow movements. In fact his attitude to period practice on the whole is fairly à la carte. The VPO’s playing is often brisk and transparent in the manner of smaller period bands, but there is no hint of the hair shirts that some period practitioners bring to this music: Rattle is happy to broaden out and revel in the beauty of the sound at key moments. On the other hand the playing is not just homogenous post-Romantic soup; there are plenty of moments that make you sit up and take notice as a particular element is highlighted by a touch such as vibrato-less strings, braying brass or occasional sforzandi. It is the selectiveness of these touches that makes them effective, meaning that for most middle-of-the-road listeners they will find this something to enjoy rather than to distract. As for the quality of the instrumental playing, with an orchestra of this stature it is outstanding. I could pick out occasional moments that stand out for their extra-special quality – the solo winds in the slow movement of the Fourth, for example – but there would be too many to make this a useful exercise. Discovering them for yourself is one of the great joys of this set. What about those craggy masterpieces in the middle of the cycle? Be satisfied that in Rattle’s hands they are not merely safe; they are towering. He gives us an Eroica of stature and power. The playing carries tremendous weight and scale: this is clearly a symphony orchestra we are listening to. It also feels very live with its minor fluctuations of tempi and the sense of a conductor straining at the tiller to keep the great ship on course. There is an almighty sense of build to the funeral march while the scherzo romps along with titanic energy. The finale unfolds with logic and argument and the tempo broadens out majestically (and surprisingly) for a coda which marks a fitting culmination of not just the movement but of the entire work. The Fifth is vibrant and dramatic, the first movement incisive and visceral, while the finale blazes with a white-hot sheen. As a bonus we are also given Rattle’s earlier (2000) account of this symphony with the same orchestra. It’s interesting to compare the two, but the 2002 account is easily finer: it’s more dramatic, more live and has a better recording to help it on its way. Only in the transition to the finale and the emergence into sunlight at the start of the last movement does it start to rival the later set. Only in the Pastoral does Rattle’s preference for the dramatic develop into a problem, the first two movements sounding taut and even a little strained in places. Things improve after this: the peasant wedding fairly frolics along and, after a terrifying storm, the shepherds’ hymn is broad and expansive. The Eighth, too, is relatively light on its feet with a satisfyingly big sound to its first and third movements and plenty of tongue-in-cheek humour to the second and fourth. Rattle’s Ninth is evidently the climax of his cycle, not just chronologically but emotionally. Everything here seems calculated to produce an impact of shattering grandeur, from the first, stunning emergence of the opening movement’s main theme through to the headlong dash for the finishing line of the finale. Not everyone will love it: some will find his selective pauses irritating and others will quibble with his tempi and use of stresses, but I was fully convinced. The Scherzo bounds along with titanic power and, after this, the expansive tempo of the Adagio sounds daring and inventive. The finale comes with its own sense of scale, but Rattle’s pacing and control of the transitions allows it all to unfurl in a way that sounds, to me, unarguable. He is helped by a top-notch team of singers. His old friends from the CBSO Chorus guest star, demonstrating that they have lost none of the power that so distinguished his Mahler recordings, and his soloists are as starry a team as one could imagine. Thomas Hampson sings with poetry and refinement, not just gusto, and both ladies bring lyricism and breadth to their music. Kurt Streit, too, sounds convincingly perky in his “Turkish” episode. So where does Rattle’s Beethoven set sit in the overall scheme of things? To my mind he carries the best of the old and the best of the new. He has a sense of structure and scale that harks back to Furtwängler and Karajan, while his lithe sense of movement contains the best of the period movement heard in, say, Norrington and Gardiner. It’s probably still true that the conductor who best encompasses both of these worlds is Harnoncourt in his set with the Chamber Orchestra or Europe, but Rattle’s sound is bigger and somewhat more Romantic. I recommend his set to anyone who hasn’t planted his flag squarely in the camp of either extreme. I certainly wasn’t disappointed. The symphonies are undoubtedly the main reason for acquiring this set, but the other items are of value too. The CBSO plays with some fitting period (vibrato-less) twang for much of the two concertos, and Lars Vogt scales back his often big-boned playing to accompany in a style that is utterly sympathetic. Again, though, there is no hair-shirted asceticism in either orchestra or piano and this is still a performance of red-blooded vigour. Vogt plays like the master we know he is, and the cadenzas tickle the listener’s ear suggestively. As another bonus we are given two versions of the First Concerto: it’s the same recording but in one version we get Beethoven’s cadenzas and in the other those of Glenn Gould. Gould’s cadenza for the first movement is witty and almost Bachian and it works tremendously well, but his version is too frenetic in the finale, which Rattle already paces with frantic busyness. Still, it’s an interesting comparison. I wonder if this was the beginning of a complete set that never emerged? A pity, but then Rattle’s later achievement with Brendel takes some beating. I have already written about Rattle’s Fidelio elsewhere in these pages. There’s really nothing to add to that, save to say that after a gap of a couple of years Rattle’s conducting seems less wilful and Denoke’s Leonore a little more amenable, but this performance still can’t hold a candle to the likes of Bernstein or Klemperer. So if this is the last instalment in EMI’s Rattle edition then they have gone out on a high. Rattle flowered later in Beethoven than he did in, say, Mahler or Britten, but for me the results are every bit as satisfying and deserve comparison with the best. Throw in the super budget price and the decision makes itself.